What would it take to make you laugh at a massacre? Would a choreographed dance number help? What about a cake in the face, a ruined wedding dress, or little blue boxes smashed onto a man’s head? When do you start laughing, and when do you stop? 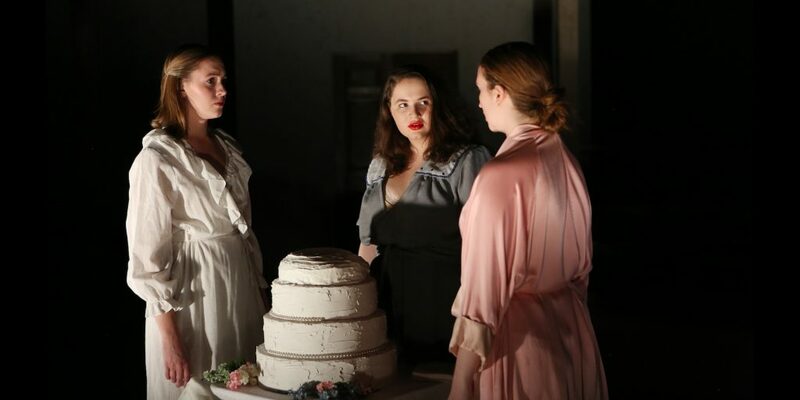 Charles L. Mee’s genre-defying Big Love, directed by long-time Skidmore Theater faculty member Carolyn Anderson, brings us to an island off the coast of Italy, where fifty sisters land after fleeing a forced marriage to their fifty cousins. There, the sisters—led by Lydia (Lucy Consagra ’18), Olympia (Rebecca Gracey ’18), and Thyona (Anabel Milton ’18)—plead to be taken in as refugees, a plan interrupted by the crashing arrival of their determined grooms-to-be. 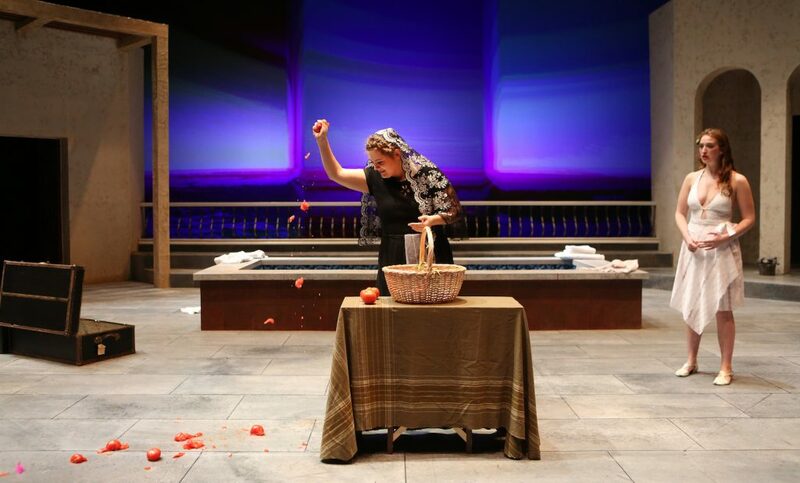 Inspired by Greek tragedian, Aeschylus’ The Suppliants, Mee’s play draws upon the theatrical traditions of ancient Greece to tackle essential questions about 21st century life. Anderson, along with assistant directors Rebecca Rovezzi ’18 and Erica Schnitzer ’18, pulls out the best of the luscious, vivid, embodied energy in Mee’s script. The world of the play is larger than life: full-sized Barbie dolls parade across the floor and characters erupt into song and dance. The men and women of the world do not speak their lines so much as shout them; each one’s words overlapping and pushing against the others’. 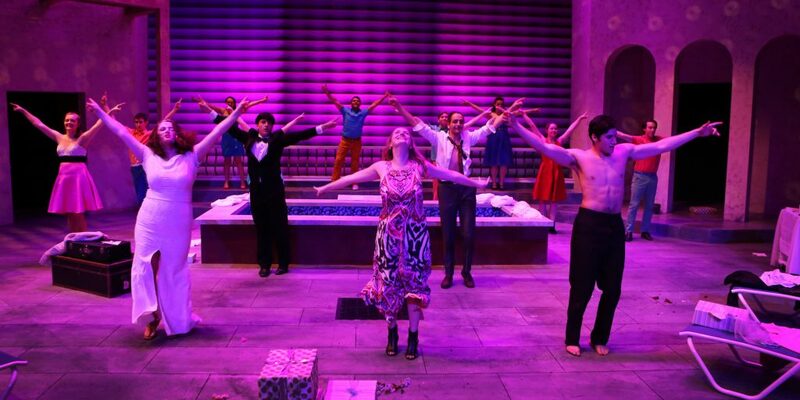 Garett Wilson’s set and Jared Klein’s lighting design transport the audience into a world of luxury, lit by the light of the hot Mediterranean sun. And Patty Pawliczak’s wonderful costume design shines in bright colors and bold patterns. Everything exists in excess: Piero’s (Nick Leonard ’20) wine glass is always full, British socialites Eleanor (Sydney Tennant ’18) and Leo (Adam Newmark ’20) savor the taste of the rich food and sensual nights Italy is home to, the brides-to-be receive towering stacks of impeccably wrapped presents. Unfortunately for the sisters, enjoying these pleasures remain out of reach. Threatened with forced marriage to their cousins and denied Piero’s protection, they must go to nearly impossible lengths to defend themselves. The sisters’ struggle resonates poignantly for politically-engaged audiences. Its parallels to the refugee crises sweeping across our global landscape are undeniable, its depictions of domestic abuse painful, and its examinations of toxic masculinity frighteningly familiar. And yet, Big Love is hilarious. It is fast-paced and rollicking. 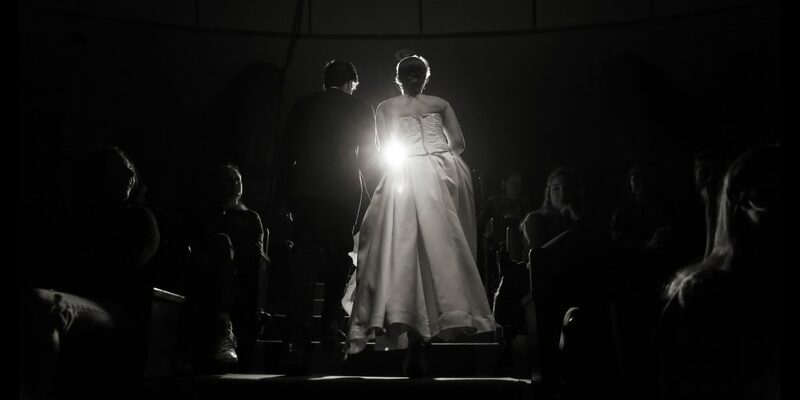 This is only right; after all, the premise for the play is the grandest wedding of all time: fifty brides, fifty grooms, one palatial mansion. After the three sisters hoist themselves onto Piero’s terrace, they burst out into Lesley Gore’s “You Don’t Own Me,” singing into a microphone and dancing with smudged eyeliner like young girls at a sleepover. When the men interrupt their inspirational party, they do it in style: parachuting down from a helicopter and popping up from trap doors, clad in dark sunglasses and skydiving jackets. Later, Constantine (Atticus Rego ’21) delivers a monologue about the harsh expectations placed on young boys while performing bicep curls with a tuxedo-clad Nikos (Matt Clyne ’20). 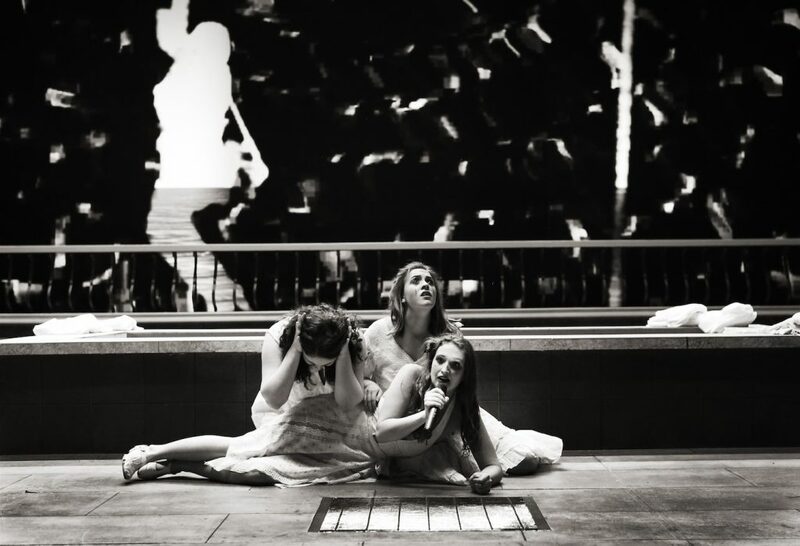 In two of the most strikingly physical scenes, the three sisters, followed by the three brothers, list out their desires and demands for a marriage while careening wildly across the stage, throwing themselves down repeatedly on the stone floor as their frustration and repression becomes uncontainable. Indeed, this sense of careening defines the sensation of watching Big Love. The play oscillates wildly between extremes, jerking its audience back and forth between comedy and tragedy, familiarity and discomfort. The discomfort reaches its peak when the sisters make a pact: they refuse to be subjugated to the will of these men. If they are forced to marry, then none of the men will make it through the night alive. 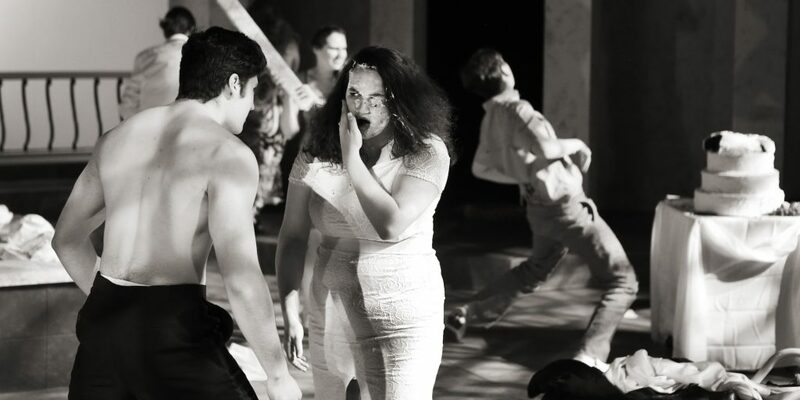 What follows is the apex of the careening chaos of the play: a massacre-slash-wedding party, featuring both ecstatic dance and wild fight choreography. The lines blur: slapstick becomes violence, seduction becomes predation, power dynamics are reversed and the men—along with many of the innocent wedding guests—die at the hands of the sisters. That is, all except for one: Lydia, having fallen in love with her new husband Nikos, spares his life. Thyona views it as treason. But is it? Was her plotting of the massacre—spurred on by fear and pain and a need to escape a lifetime of abuse—evil? And could anything have been done to prevent this? The answer to that last question, at least, is unquestionably yes. Earlier in the play, Piero offers a compromise to dueling parties: while all fifty women would not marry all fifty men, surely one or two love matches could be found among the bunch, and in these “true” marriages, the women could concede. Ultimately no compromise is reached, and the characters’ insistence on binaries and absolutes costs countless lives in the process. This is truly Big Love’s triumph: it exposes the seemingly never-ending set of binaries that our society imposes on us, highlighting the cruel impossibility of these absolute, either-or distinctions. These binaries—men/women, dominance/submission, pleasure/pain, strength/tenderness, justice/forgiveness, comedy/tragedy—trap us. Only in the refusal to accept absolutes can we free ourselves from their bind. Only in the honest pursuit of companionship and desire can we find truth and happiness. When society does not serve us, as Thyona says, “We make our own laws.” When those laws fail, we try again. As Bella (Emily Cross ’20) reminds us, “Love is the highest law.” And as Big Love bravely insists, that love can save us all. Caity Cook ’18 is an English major, Theater minor, previous Editor-in-Chief, and current staff writer for the Living Newsletter.